We recently celebrated my Mother's 70th Birthday Party, for this joyous occasion the entire family spent the weekend at a wonderful house perched proudly in the Macedon Ranges, Victoria. The weekend was full of Birthday celebrations and I will be posting more items in the weeks to come. For many years my mother has collected owls, so they became the theme of the party. To start this series of Owl inspired Birthday posts I've decided to start at the very end, the final course, the all important Birthday Cake. Given we were away from home, we opted to purchase an iced Angel cake and found a wonderful bakery in Gisbourne called Ferguson Plaire. And, given the popularity of Giggle and Hoot I was able to find some fondant owls at my favourite cake supply shop West's Cake Decorations, the remainder of the decorations included Gold candles and a combination of small Owl candles and Butterflies, 70 candles in all. 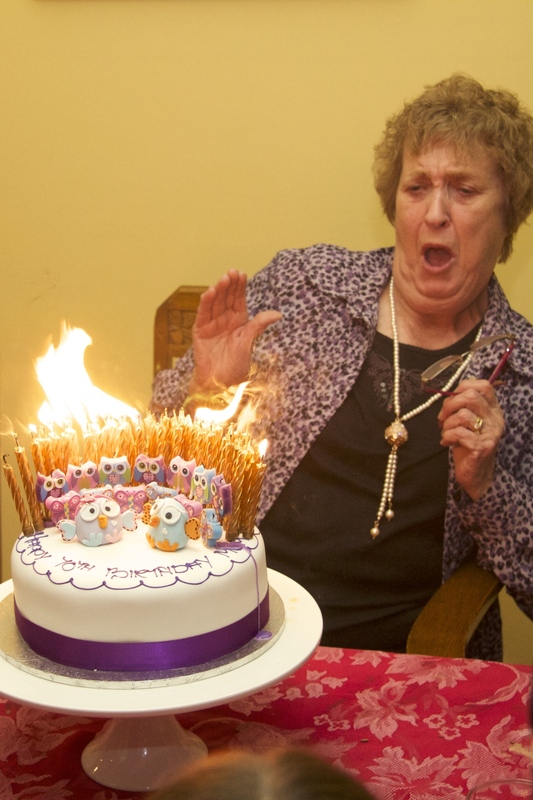 Now, for all of you contemplating placing 70 candles on a Birthday cake I've included a series of Photo's below to help you make up your mind. Step Three - Oh no, can't they sing any faster? Step five - time to relax, they have stopped that song, I can finally blow these candles out. Step Seven - Oh no, will these candles ever go out? Step Eight - finally, I can relax and enjoy this cake. 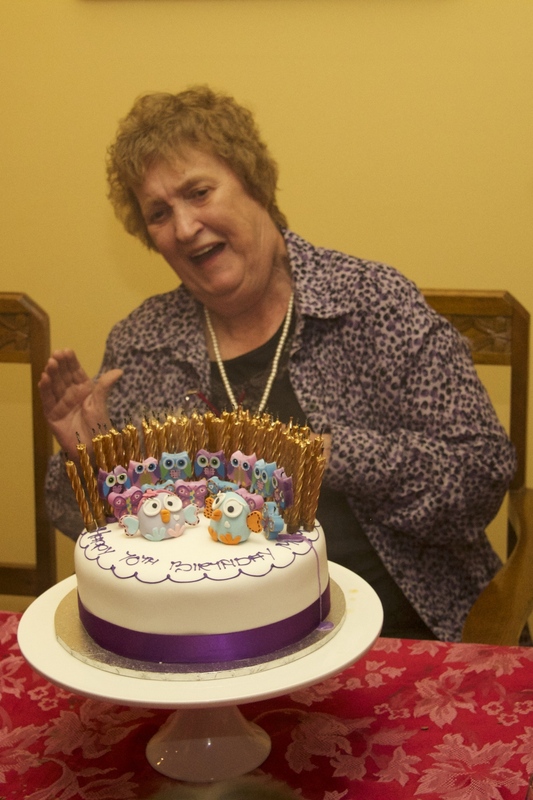 Well, while terrified at the time, mum can now laugh at her 70th Birthday cake.